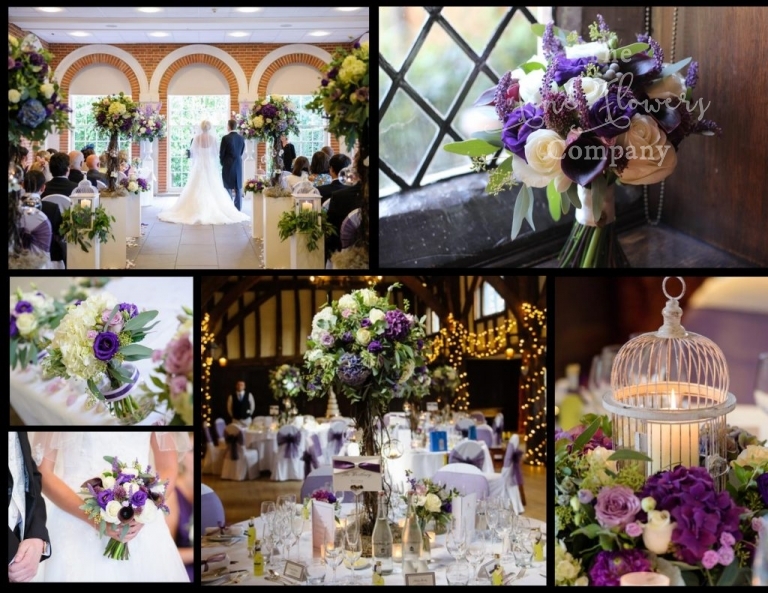 These beautiful purple wedding flowers at Great Fosters were a real joy to work on. Joanna and Antony chose a beautiful colour scheme of rich purple and ivory, mellowed by softer two tone shades of lilacey purple, and since I LOVE purple, I was really enjoying the opulent mix of colours. Combined with pretty rustic flower trees and romantic candle lit bird cage centrepieces, it made for a lovely overall effect, and it was so refreshing to see a lovely deep colour being used. 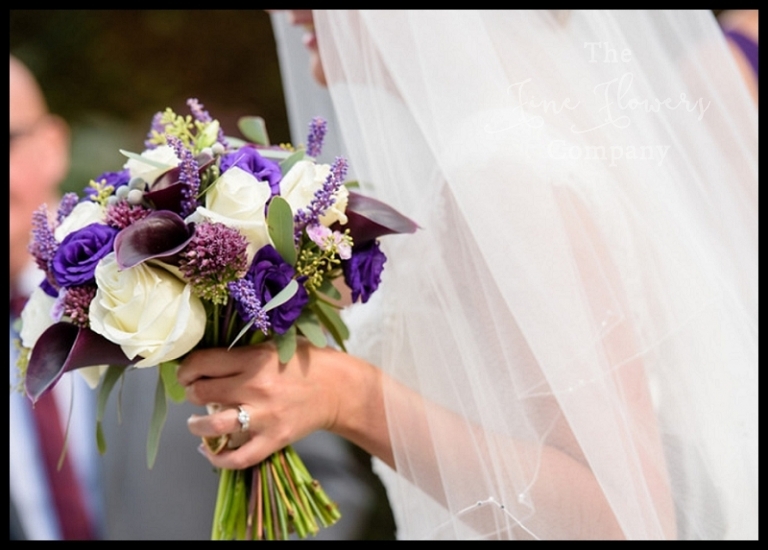 For her and her bridesmaids Joanna chose handtied bouquets of ivory roses, deep plum calla lilies, purple lisianthus and purple muscari, with silvery berried eucalyptus. 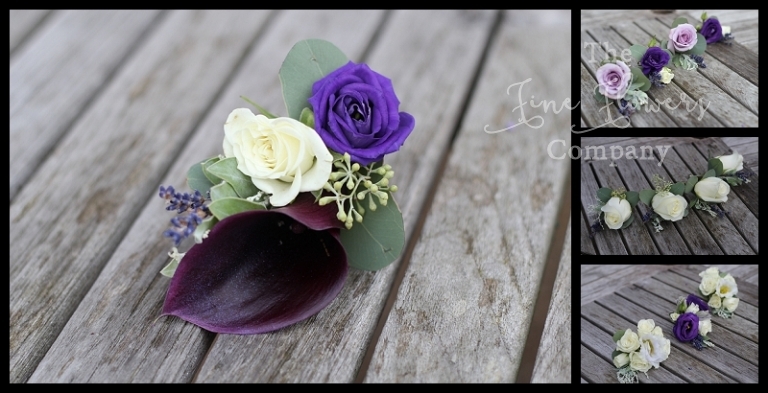 Antony wore a beautiful plum calla lily buttonhole while the rest of the men wore ivory rose and purple lisianthus buttonholes. Little page boys had matching lisianthus buttonholes, and the mums wore pretty corsages of spray roses and lisianthus. The wedding ceremony took place at Great Fosters in Surrey, in the beautifully light Orangery. Joanna and Antony opted for a dramatic wedding aisle lined with ‘more chic than shabby’ vintage bird cage centrepieces, alternating with tall rustic flowers trees. The ceremony table was styled with a line up of pretty posies of flowers in vases, and the ceremony area itself was flanked by two amazingly grand urn centrepieces bursting with colour. We used tall delphiniums, a mix of richly coloured purple hydrangeas with hues of plum and lilac, lots of roses, clematis and lisianthus. Following the ceremony, the displays were moved through to the beautiful tithe barn and looked amazingly atmospheric, with hanging tea lights on the rustic trees and the candle-lit bird cage centrepieces casting a beautiful ambience around the tables. The tall rustic trees were used to dress the central tables, in the tall part of the barn, while the low vintage bird cage centrepieces were reused, to dress the tables under the eaves, on the two sides of the barn.